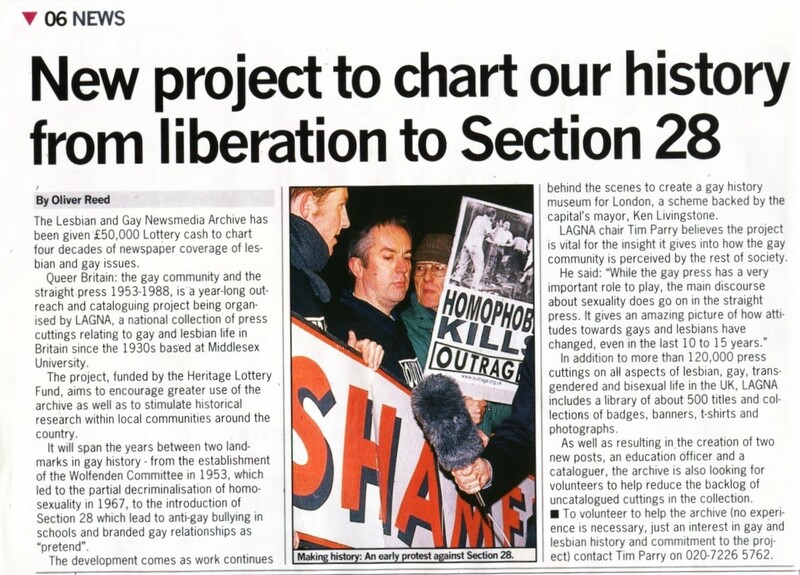 From November 2004 to December 2005 the Lesbian and Gay Newsmedia Archive embarked on a year-long outreach and cataloguing project, funded by the Heritage Lottery Fund, intended not only to encourage greater use of the archive but also to stimulate historical research within local communities around the country. An outreach officer, Robert Thompson, was appointed to give Powerpoint presentations based on the archive to groups in the United Kingdom who could provide a venue and an audience. Norena Shopland was appointed as part-time cataloguer. She identified appropriate regional material and worked with the volunteer team to reduce the backlog of uncatalogued cuttings in the collection. In February during LGBT History Month 2005. Robert gave several presentations during the month, including in Manchester and in London. Robert spoke on the Rally Stage in Trafalgar Square on Saturday 2 July 2005, for Pride 2005. On 6 October 2005 we organised a evening event "Queer Britain: The Gay Community and the Straight Press" which was held at the London Metropolitan Archives. The speakers were Robert Thompson, Peter Tatchell and Sue Sanders. For LGBT History Month 2006 Robert provided exhibition material to Pentonville Prison, North London. On 13 February 2006, Robert gave an illustrated talk to the Nottingham & Notts Lesbian & Gay Switchboard History Project on "Lesbians, Gay Men & the Media" - this looked at media stereotyping. For the HLF-funded project, Tim Parry was appointed Project Manager, and Oliver Merrington LAGNA Webmaster. They both continued in 2006 in a voluntary capacity. Peter Tatchell: "Queer news through straight eyes - how the mainstream media filters news on LGBT issues"
Sue Sanders: "The experience of LGBT history month at the hands of the straight press"
Robert Thompson: "What a load of benders: the straight press does gay"